‘Super Grandad’ is UK’s most active person over 65! Oct 26, 2015NewsComments Off on ‘Super Grandad’ is UK’s most active person over 65! ‘Super Grandad’ is crowned as the UK’s most active person over 65! At the age of 78, most people will be putting their feet up, but ‘Super Grandad’ Bill Moore, believes that getting old doesn’t have to be mandatory. Having fought off tough competition from all over the country to be crowned the Older Actives Champion, he proves that age is just a number! After months of searching, Bill Moore from Yorkshire, has become the national winner of The Older Actives competition launched by celebrity fitness guru Mr Motivator in June 2015. The competition sponsored by Ateronon – a natural health supplements company scoured the UK to prove that anyone, regardless of age, can remain active later in life. After sifting through hundreds of worthy competitors, Bill was named the overall champion including the North East winner. Bill, an avid swimmer, yogi and active walker has proved that age is just a number, taking the crown as the UK champion. 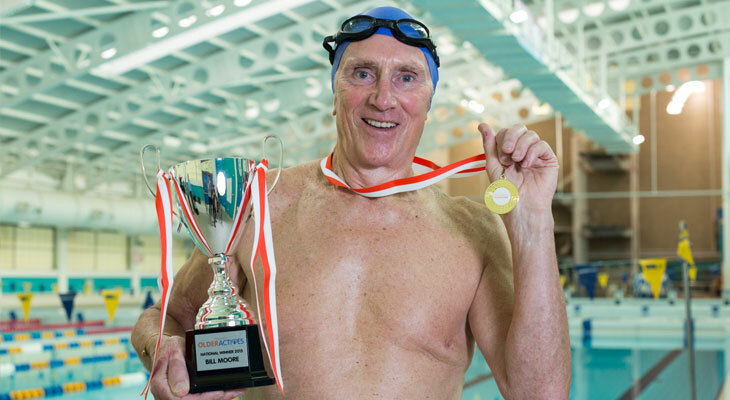 Having first dipped his toes in the pool at the tender age of five years old, Bill has won 38 national titles over the years, breaking and maintaining the British Record twice in the 70-74 age group, with the last record still standing eight years on. Bill also won the Yorkshire Master of the Year trophy six times and has swum all over the globe at events including The World Masters Games in Melbourne, Edmonton and Sydney, The European Masters in Prague, Millau, Kran and Germany, and the annual Swimathon every year since 1999, raising money for charity. Bill competed in the Great Scottish swim in Loch Lomond in August beating his three sons who are all aged over 50. As well as swimming on average of seven miles per week and regularly attending Yoga classes to keep flexible, Bill also finds time to walk 10 miles once a week. Bill said: “I am over the moon to have been crowned ‘The Older Actives 2015 Champion.’ It was one thing to be told that I had won the regional heat in the North East, but when I was told I had won nationally, I was overwhelmed with emotion. “I swim with a very successful club made up of national champions. They are all considerably younger than me but that is advantageous because it keeps me young as well. As far as I am concerned age is just a number and you are only as old as you feel. I feel young because I think young and that gives me a feeling of wellbeing. “We wanted to celebrate the achievements of the older generation and the Older Actives competition has done just that. We have unearthed a wide variety of people, from those who like to rock n’ roll to people that enjoy cycling or gardening, as well as more extreme activities such as scuba diving and competing in ironman races. The Older Actives Campaign was launched alongside Ateronon Active, a natural supplement containing Curcumin (a turmeric extract) that provides relief for those with joint aches and pains. It can also assist anyone who exercises and wants to combat the effects of muscle soreness. The competition selected nine regional winners* from around the country, culminating in an overall national champion winning a bundle of prizes. These included £500 worth of Ateronon products, £100 Marks & Spencer vouchers, £1,000 worth of UK holiday vouchers and the accolade of being crowned the ‘Older Actives 2015 Champion’, receiving a trophy.